Does a Clinton Campaign Staffer Stand a Chance in Trump Country? RIPLEY, W.Va. — There are few places where Hillary Clinton is more toxic than West Virginia. So why does a former Clinton campaign staffer think she stands any chance of flipping a House district here? Talley Sergent, the state director for Clinton’s 2016 campaign, is coming off a resounding primary victory in the 2nd District, which stretches through central West Virginia into the eastern panhandle. Despite being outspent more than 2-to-1, she defeated a New Jersey transplant backed by national veterans groups by 25 points. Touting herself as a sixth-generation West Virginian, Sergent’s now trying to unseat GOP Rep. Alex X. Mooney, the former chairman of the Maryland Republican Party, who moved to West Virginia shortly before running for Congress in 2014. Both candidates marched in the the July Fourth parade here last week. 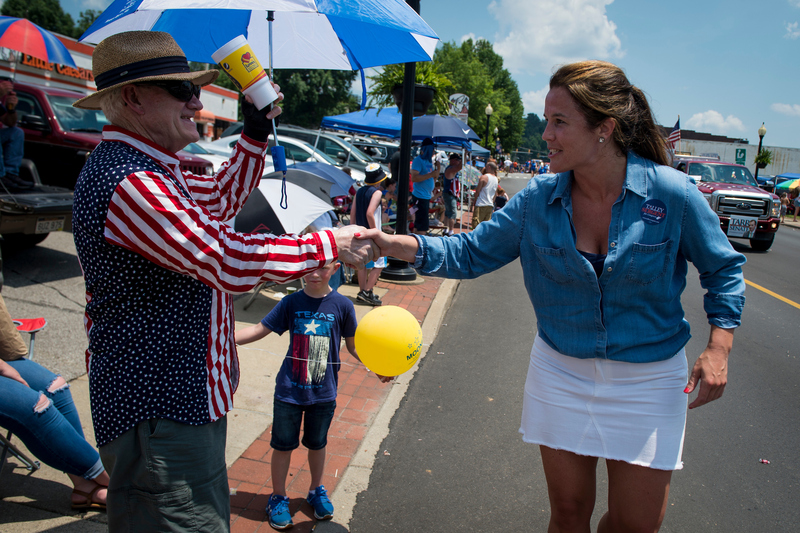 Mooney was close to the front, just ahead of GOP Senate nominee Patrick Morrisey, while Sergent was nearer to the end of the 200-float procession, far behind the Democratic senator at the top of her ticket. 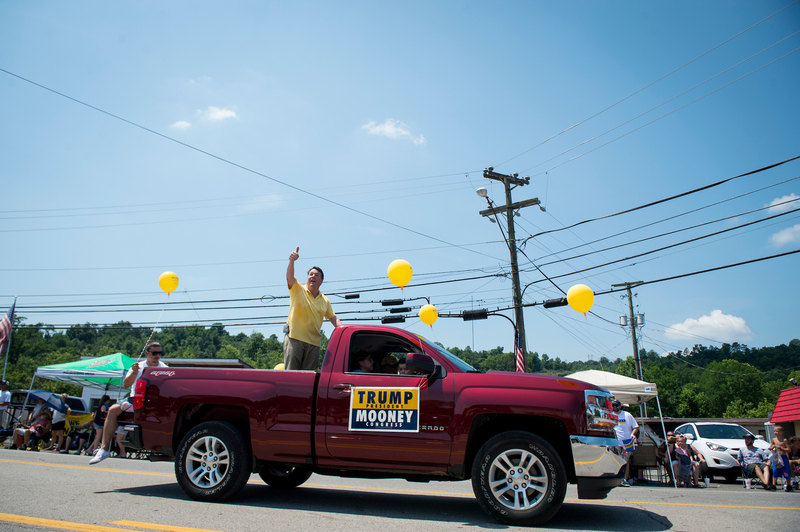 While Mooney is trying to nationalize the race — he mentioned either Clinton or House Minority Leader Nancy Pelosi eight times in a statement on his opponent’s primary win, and he marched with “Trump-Mooney” signs on his pickup truck — Sergent is doing everything she can to localize it. “I’m not endorsed by Nancy Pelosi’s DCCC, and I don’t want to be,” she said in an interview after the parade. The Democratic Congressional Campaign Committee has not included Sergent on its Red to Blue list of top recruits, though it did recently add another West Virginia Democrat, Richard Ojeda, who’s running in even bigger Trump territory in the 3rd District. Inside Elections with Nathan L. Gonzales rates Sergent’s race Solid Republican. EMILY’s List hasn’t endorsed Sergent either, although the candidate said she’s spoken to the pro-abortion rights group. “I don’t know of a single race the DCCC or EMILY’s List has ever won in West Virginia. And so I’d rather not have that kiss of death,” she said. Sergent hustled her way along the 1.5-mile parade route, shaking hands with viewers on either side of the street, and occasionally wiping her brow with a red bandana tucked into her back pocket. “I’ve heard about you,” a few paradegoers called after her. “If it’s good, it’s true,” she shouted back, with a slight West Virginia twang. She’s adopted a critical line of the national party, saying she would “absolutely not” back Pelosi for Democratic leader. “I think that the president’s popularity — I think that he’s tapped into an energy that national Democrats are still trying to figure out,” she said, standing in a county where nearly 80 percent of voters backed President Donald Trump in 2016. Out of the state’s three House districts, Clinton actually performed the best in the 2nd District. But she still lost by 36 points. The biographical section of Sergent’s website mentions her work for former West Virginia Democratic Sen. Jay Rockefeller, for the State Department, and for Coca-Cola in Atlanta. It omits her work for the 2016 presidential candidate. Rockefeller’s longtime consultant Geoffrey Garin, who also worked for Clinton in 2008, is doing Sergent’s polling. “It’s a job she had. I don’t sense it’s necessarily the way people are going to evaluate her,” Garin said in an interview Wednesday. He thinks Sergent’s image as a “homegrown West Virginian” will be more important. Garin hasn’t polled Sergent’s race yet, but he conducted a statewide poll for the Democratic Senatorial Campaign Committee last month that included a large enough sample to look at the 2nd District. “Really, all across the state, voters said they’re not looking for someone they can count on to support Donald Trump; they’re looking for someone they can count on to be with Trump when he’s right and stand up to him when he’s wrong,” Garin said. Sergent insists voters don’t ask her about Clinton. But in an era when even Democratic candidates who have never interacted with Clinton or Pelosi are being tarred by association, Sergent is likely to face an onslaught of attacks tying her to the former secretary of State and the national party. “I suppose it’ll be just about everything I say,” Mooney said in a phone interview Friday. And he’ll have a cash advantage to get that message out, although Sergent downplays the importance of money, noting the recent success of other candidates around the country who raised less than their opponents. Democrats still have a registration advantage in the state, but some of those Democrats are big Trump supporters. His approval rating was nearly 70 percent statewide in a recent Monmouth University survey. “It’s hard to overcome that,” said West Virginia Treasurer John Perdue, who, along with Sen. Joe Manchin III, is the last remaining statewide-elected Democrat. He was mingling near Sergent at the parade staging area. For Sergent, that means talking about home. She grew up in Huntington (in the neighboring 3rd District) and moved back to the state in 2016, settling in Charleston. She talks about her mother being a public school teacher and joining her and other teachers on the picket lines in the teachers’ strike earlier this year. She also speaks openly about her family’s struggle with opioid addiction. Her mother is raising her niece and nephew because her sister is an addict. And as much as Mooney will talk about Sergent’s work for Clinton, Sergent doesn’t hold back about his thin ties to the Mountain State. “It folds into the broader picture of him — because there’s no other way to put it, other than that he doesn’t give a damn about the people here,” she said, citing his vote to repeal the 2010 health care law. “The fact that he moved here just to run for office shows he is an opportunist; he is a politician,” Sergent said. But Mooney has overcome that attack line before — twice. When he first ran for the open seat that Shelley Moore Capito vacated for a successful Senate run in 2014, Democrats called him a carpetbagger. He won by just 3 points in a good year for Republicans. Two years later, the national Democrats’ recruit didn’t make it through the primary, and Mooney ended up winning re-election by 16 points. “It has taken me a lot of time and effort to get known in the district,” Mooney said, admitting that Trump outperformed him by 8 points in 2016 and that he’d like to get closer to the president’s numbers in the district. “It’s going to take more work — I acknowledge that — it’s going to take a spirited campaign,” the congressman said, noting the 2nd District stretches across 17 counties. But he acknowledged that incumbency also has its downsides.